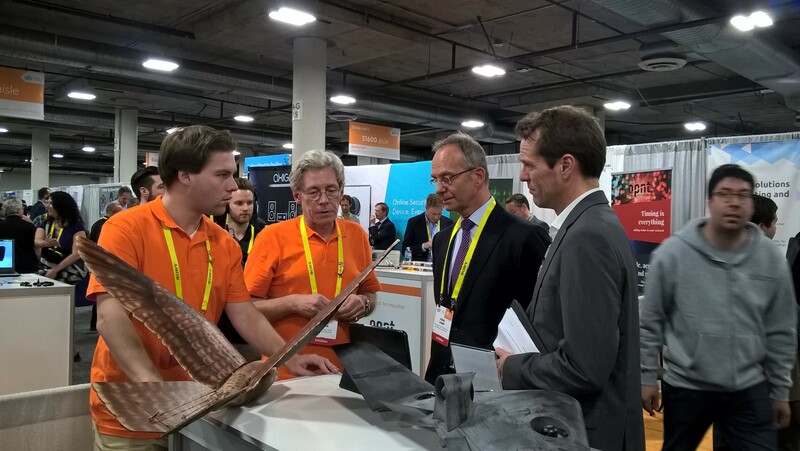 A delegation of Dutch robotics start-ups recently travelled to Las Vegas and Silicon Valley as part of a trade mission with the Dutch Ministry of Economic Affairs. Anouschka Versleijen, manager strategic partnerships at RoboValley, together with the Netherlands Enterprise Agency (RVO) organised the dedicated robotics track of this trip. Henk Kamp, minister of Economic Affairs hosted the mission, together with Prince Constantijn, the special envoy for start-ups at Startup Delta. The week-long trip started with three days at the Consumer Electronics Show in Las Vegas. A group of robotics companies took part in the Holland Pavilion, where Dutch companies presented themselves to the 165,000 visitors that attended the show. Aerovinci, Elpanav, Birds.ai, Cropzoomer, Clear Flight Solutions and Interactive Robotics. Clear Flight Solutions gained a lot of attention; TechCrunch declared their Robird as one of the ten coolest gadgets of CES. After Las Vegas, the delegation descended on San Jose, from where a trade mission was undertaken to an impressive list of Silicon Valley based companies. This included companies such as Intel, Microsoft and Google [X]. The robotics track visited, amongst others, Sebastian Thrun, Adjunct Professor at Stanford University, CEO of Udacity and, since 2016, an honorary doctor of Delft University of Technology. "I am very proud of what the Netherlands has to show. Our robotics companies are the result of some of the best scientific research in this field"
Looking back on the mission to the US, Kamp said he is ‘very proud’ of what the Netherlands has to show. “Our robotics companies are the result of some of the best scientific research in this field, which even the Stanford professors acknowledge does not come from Germany or the United Kingdom, but from the Netherlands”. For RoboValley, both the visit to CES and the trade mission were very successful. Our start-up companies made connections to investors and potential customers, we strengthened our academic ties and broadly marketed the upcoming RoboBusiness Europe.